David Drips has spent weeks tending cannabis seedlings and clones inside an old milking barn in rural Petaluma in preparation for the day he’d plant them in the ground. On Friday, that day arrived. With a pending permit and county permission to start, he and several others nestled plant after plant into the loamy soil at the windswept Nadale Ranch on Middle 2 Rock Road, where they’ll grow alongside several hundred head of dairy cows. But complaints against legal cannabis cultivation are mounting in some rural Sonoma County areas, from wooded enclaves west of Healdsburg to farmland outside Petaluma and narrow vineyard-lined lanes in rural Santa Rosa. Echoing concerns about traffic and water use often spurred by new wineries, critics of legal cannabis farms also question whether they will be safe living or working near marijuana farms. 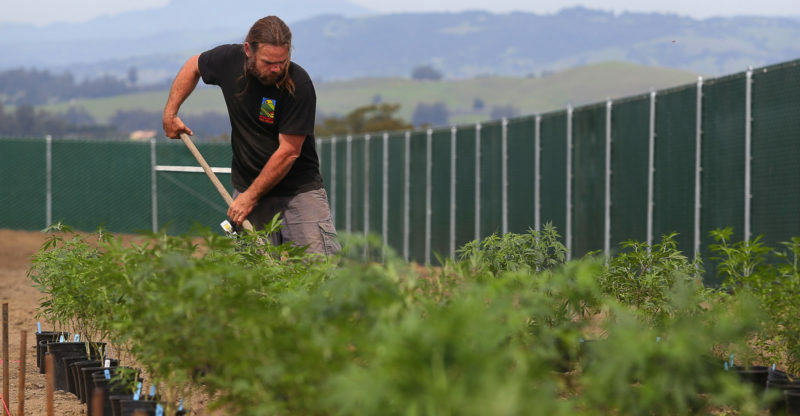 Yet local cultivators and out-of-town entrepreneurs seeking to take part in Sonoma County’s legal trade and broaden its farm-to-table ethos are colliding with neighborhood fears following several violent robberies linked to illicit marijuana. Property and zoning rights are pitted against safety concerns. Potential tax and other revenues are bumping up against fear of the illegal drug trade. A series of home-invasion robberies with out-of-state suspects coming to Sonoma County to steal marijuana, cash and guns have set some neighbors on edge. Robbers broke into five homes during the Feb. 8 and March 12 incidents, tying up residents and ransacking their homes. In one case, a man was killed and another man wounded by gunfire. The targets weren’t legal marijuana growers, according to investigators, but that brings little comfort to people uneasy about marijuana farms near their homes. That frightening possibility has been present for years as marijuana has been a thriving, if underground, part of the regional economy. But now, residents have new avenues to object to cannabis operations in their midst. Legitimate cannabis entrepreneurs are worried policies may be reversed after they’ve invested tens of thousands of dollars into properties, permit fees and technical studies. “We have an industry that is begging to be regulated, begging to be sunlighted, begging to contribute pretty exorbitant tax revenue,” said Erin Carlstrom, a lawyer and former Santa Rosa City Council member who currently represents cannabis companies coming into compliance. The neighborhood controversies have led at least one county supervisor — David Rabbitt — to rethink whether the county should further limit cannabis cultivation and change the ordinance governing the newly regulated cannabis industry. The neighborhood controversies are likely to dominate an April 10 Board of Supervisors meeting, the first opportunity they will have to discuss at length how the ordinance appears to be functioning. Rabbitt, whose southern district includes the Petaluma area where home invasions targeting marijuana occurred in March, said he’s interested in giving residents more ways to oppose cannabis projects and he prefers cultivation to be in warehouses, not outside. At the other end of the political spectrum, Hopkins, whose family runs an organic produce farm, said she envisions a future where small-scale cannabis farms blend seamlessly with their surroundings, giving existing farms ways to diversify their crops while keeping farming vibrant and financially sustainable in Sonoma County. Some of the arguments against lawful marijuana cultivation echo common objections about any new agricultural project — disputes which arise from a decadeslong socioeconomic shift in Sonoma County where working farms are transforming into rural estates. Sonoma County supervisors and cannabis industry leaders have said they want to usher the legal local marijuana grower out of hiding and into the mainstream. But policies have done little to make that vision a reality. The county so far has permitted three cultivation projects to start in unincorporated areas — including one indoor warehouse and two projects to grow outside — a fraction of the estimated 5,000 cannabis growers in the county. Although two of the issued permits went to longtime local growers, applicants include people new to the area, evidence of the county’s allure. The Board of Supervisors could have taken steps to prioritize local growers and discourage, or even bar, people who haven’t grown in the area. But it didn’t. Mendocino County, on the other hand, gave local cultivators an advantage by requiring people to demonstrate proof they had been growing marijuana in the county prior to 2016. 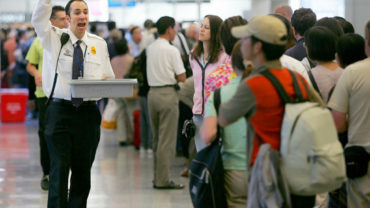 That requirement was offered for a little over a year, and it will be lifted after June 30. Imbimbo, the Healdsburg-area resident, voted along with the majority of Californians in 2016 to legalize cannabis and create a legitimate industry out of an illicit one. But he is building a case for his little community along a private road near the Mill Creek watershed to be what’s called an “exclusion zone” where cannabis cannot be grown, similar to the way neighbors can lobby the county to prevent homes in certain areas from becoming vacation rentals. Imbimbo feels county supervisors have paid lip service to area’s small-scale farmers, but that policies don’t support that mission. Neighbors of his bought a wooded property last year and applied to the county to grow in three locations: inside a structure and a greenhouse and outside. One of the owners, a Sacramento-area man, said he wasn’t ready to talk publicly about the project. Imbimbo and his wife moved from Oakland to Sonoma County in mid-2016, landing on a private 4-acre property that was supposed to be remote and safe. Now, they worry criminals will come looking for the pot grower next door but end up at his house instead. Galvanized by a shared opposition to a marijuana farm proposed on a 37-acre property, members of the resistance group not only are demanding the county prevent the project and others in the area from moving forward, but also ban outdoor cultivation altogether. They’ve hired experts to study water issues in the agricultural enclave and convened a meeting last month to present their concerns to Rabbitt and county officials. A representative for the group, Autymn Condit, 22, said her family moved to their 20-acre property about 10 years ago. Their primary income comes from outside work, but they grow most of their own food. Condit said her coalition of neighbors feel six proposed legal marijuana sites within what they estimate to be a 3-mile radius of Purvine Road is too many. “The fact is, if it was a winery, we would oppose it on the same grounds, but it (marijuana) also has additional problems,” Condit said, noting safety concerns. The group’s primary focus is a 1-acre cannabis farm proposed by Sam Magruder, a San Franciscan who is part of an investment group called Big Rock focused on hospitality, wellness and cannabis projects. Magruder, 39, grew up in Vermont in an area he says looks a lot like Petaluma. He earned bachelor’s degrees in biology, botany and sustainable agriculture from Humboldt State University. He said he started growing pot while a student after becoming a caregiver for a man with multiple sclerosis who used cannabis to treat his symptoms. Magruder initially bought a property outside Sebastopol but had to sell it after realizing the rectangular shape of the land made it impossible to meet the county’s setback rules, which require marijuana to be a certain distance from property lines and residences. The Purvine Road property meets those standards, and he built a redwood fence to shield the only neighbors within sight. His property will have two full-time security guards, locked gates, an alarm system and cameras, and all employees will undergo background checks. They will build fences around the garden and surround the fence with native trees and other plants. They’ll also have vegetables, gardens attracting bees and other pollinators, and small gatherings like a recent lamb roast, Magruder said. He has invited members of No Pot on Purvine to the property and speak with him directly, but said they declined. He feels the neighbors are spreading false information about his project, particularly its estimated water use. “If you can’t cultivate here, you can’t cultivate anywhere in Sonoma County,” said Magruder. Sonoma County now anticipates revenue from cannabis taxes and business permits will fall $1.8 million short of initial expectations in the fiscal year that ends June 30, because so few growers have registered to produce pot legally. Agricultural Commissioner Tony Linegar said the county’s requirements for cannabis cultivation are “onerous,” covering everything from sensitive ecosystems to security — measures required of no other agricultural activity. Legal marijuana growers will be the first agricultural group in Sonoma County required to meter and track groundwater use. Linegar said the footprint of cannabis will be “tiny.” If every application currently with the county is approved, which is unlikely, the cannabis growing operations would cover about 40 acres. By comparison, Sonoma County’s $590 million wine grape crop covers more than 60,000 acres. Sonoma County’s rules banned pot cultivation in areas where it traditionally has been grown, areas called rural residential and agriculture residential zones, regardless of the size of the parcel. Some neighborhood groups championed that decision, but the unintended consequence is a majority of existing cannabis operators have been forced to find new places to grow. “You’re seeing migratory patterns of cannabis cultivation, so that change has been alarming for some of the neighborhoods,” said Hopkins, whose west county district has long been known for marijuana trade. Natasha Khallouf of Sebastopol is one of those migrating cannabis farmers, and she holds one of the few cultivation permits so far issued by the county. Khallouf, 34, a single mother of two, practices acupuncture, herbal medicine and nutrition at an integrative medical clinic in Sebastopol. She moved to Sonoma County from Santa Cruz about 13 years ago. She is leasing, with an option to buy, a 5-acre parcel in Penngrove. It is a flat and rectangular piece of land that was used by neighbors with horses. Standing there recently amid crowing roosters and tweeting birds, she described the long hedge row she’s planning with native plants and flowers to shield the neighbors from the sight of marijuana plants. She’ll raise animals and plant a large herb garden geared toward Chinese medicine. Her parcel is surrounded by houses. Some neighbors have complained, and they convened a meeting with Rabbitt and other county officials. Khallouf wasn’t invited. She attended anyway, but said she felt let down by Rabbitt and other county officials who didn’t invite her to speak or answer questions raised by residents. Rabbitt, asked about the meeting during an interview, said he was there only as a guest to listen to the neighbors’ concerns. Where should legal cannabis be allowed to grow in Sonoma County?